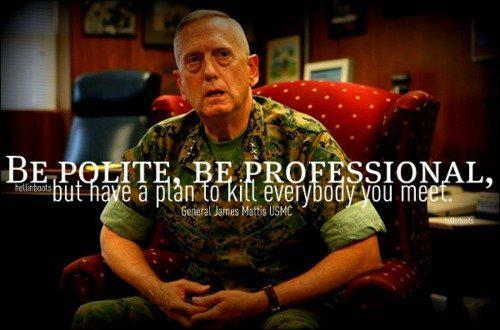 You’ve heard some of the motivating remarks by Gen. James Mattis, but did you know about the memes floating around the Internet that showcase some of his best quotes? 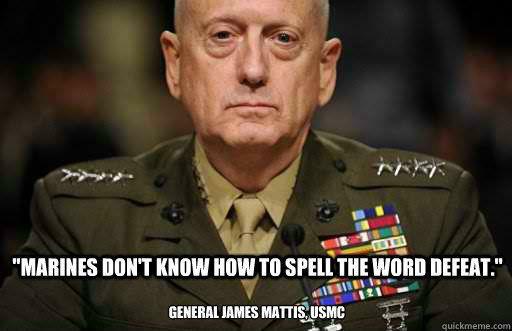 Marines love Mattis, this we know. One launched a presidential campaign for the outgoing head of U.S. Central Command. And another got fired over having one of the “Warrior Monk’s” famous quotes tattooed on his arm. Mattis simply motivates today’s generation of Marines, and that has spread to the digital sphere. So in honor of this week’s profile on Mattis, as he prepares to pass the CENTCOM torch to Army Gen. Lloyd Austin, we’ve rounded up some of the general’s colorful quotes that have been tailored to motivate you even as you sit at your computer. And be sure to pick up a copy of this week’s Marine Corps Times for a full look at the dynamic career of Gen. James Mattis. Why he said it: This line closed the then-commanding general of 1st Marine Division’s all-hands message leading up to the invasion of Iraq. Why he said it: It was one of the rules then-Maj. Gen. Mattis gave his Marines in Iraq, as quoted in “Fiasco: The American Military Adventure in Iraq” by Thomas E. Ricks. 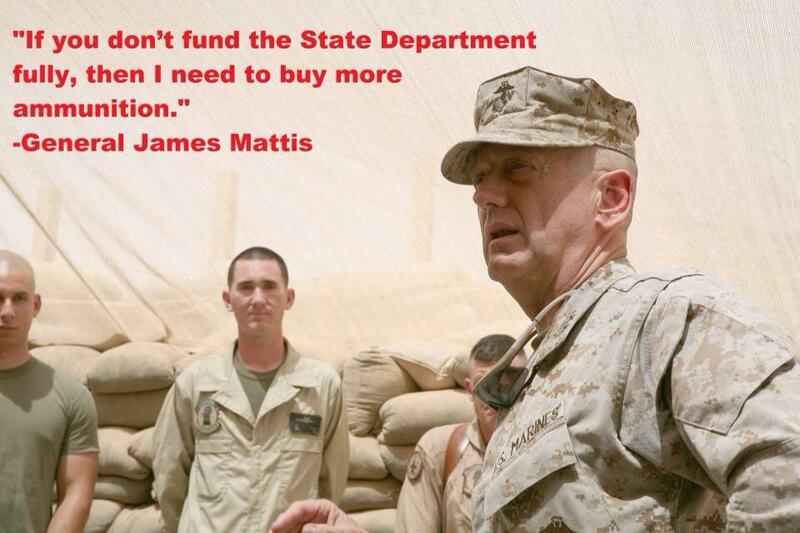 Why he said it: While testifying in front of the Senate Armed Services Committee, Mattis was asked if Congress should boost funding for the State Department in the wake of a deadly terrorist attack on a diplomatic facility in Benghazi, Libya. 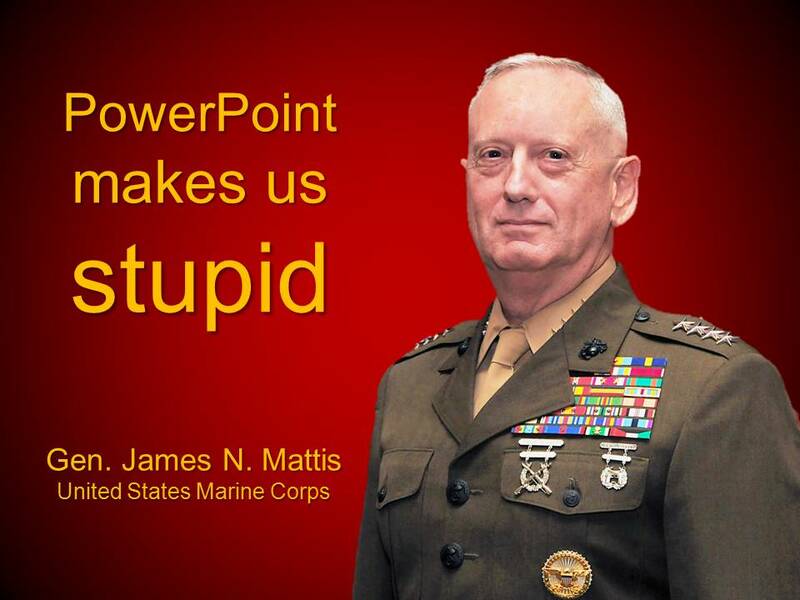 Why he said it: Mattis was responding to the point being made by Pentagon officials that the military had become obsessed with PowerPoint slides. It followed a comment made by Gen. Stanley McChrystal, who was shown a slide on the Iraq War that was so complicated, he quipped that when they figured out how to read it, they’ll have won the war. Why he said it: In an interview with North County Times, Mattis was asked about the timeline of withdrawal from Iraq. He said the enemy shouldn’t know if a hard deadline was in sight, and that Marines would stay and continue to fight and protect no matter what was thrown in their paths.